FreeWheel has released its 2016 year-end Video Monetization Report, revealing, among things, that ad views in live streams grew 36% in 2016, powered by marquee sports events and the U.S. presidential election that were streamed to connected devices. FreeWheel cited the Summer Olympics, Super Bowl 50, Game 7 of the World Series, and the first presidential debate in particular as major contributors. More broadly, live video helped drive the 24th consecutive quarterly increase in both content views (up 20%) and ad views (up 17%) in Q4 ’16. For the full year 2016, content views increased 26% and ad views increased 24%. Another major trend continues to be the shift in viewing from desktops/laptops to TVs, via both connected TV devices and set-top boxes enabling VOD. 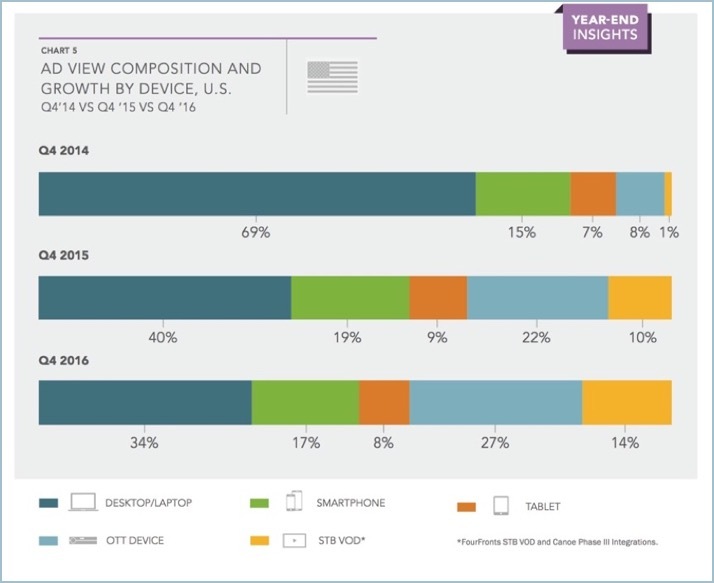 Back in Q4 ’14, desktops/laptops accounted for 69% of ad views, but in Q4 ’16, it dropped by over half, to just 34%. It was displaced by connected TV devices, which more than tripled from 8% share in Q4 ’14 to 27% in Q4 ’16 and STB VOD which surged from 1% to 14%. That means combined connected devices and STBs contribute 41% of ad views, illustrating how significantly watching on-demand and live video has migrated to the TV (and keep in mind that FreeWheel isn’t counting ad-free SVOD like Netflix and Amazon, which are all long-form and even more disproportionately watched on TV). Given the strong adoption of ad-free SVOD, content providers are grappling with ad loads and optimizing the viewer experience. But on this scale, the report noted contradictory trends in the length of mid-roll breaks. For live viewing, ads per mid-roll break declined from 6.2 to 4.6 from Q4 ’15 to Q4 ’16 (with break length also dropping from 130 seconds to 104 seconds). Yet for on-demand content, ads per mid-roll break increased slightly from 3.7 to 4.05 from Q4 ’15 to Q4 ’16 (with break length also nudging up, from 92 seconds to 99 seconds). Further on monetization, FreeWheel also observed that automated, or programmatic advertising, is increasing for both programmers (i.e. TV networks) with share of ad views up from 3% in Q4 ’14 to 7% in Q4 ’16 and Digital Pure-Plays (i.e. online publishers), where it tripled from 9% to 27% over the same period. FreeWheel noted that Programmers are cautious about exposing their most valuable inventory to brand safety and compliance risks common with open exchanges. Overall, the FreeWheel 2016 VMR again shows how robust premium online video continues to be and how viewers are increasingly gravitating to consuming it on their TVs via connected devices and advanced set-top boxes. No doubt these trends will be uninterrupted in 2017. As always the VMR is available as a complimentary download.